We Are Brando are an electrifying three-piece deeply influenced by the musical frequencies of the late ‘70s and ‘80s. 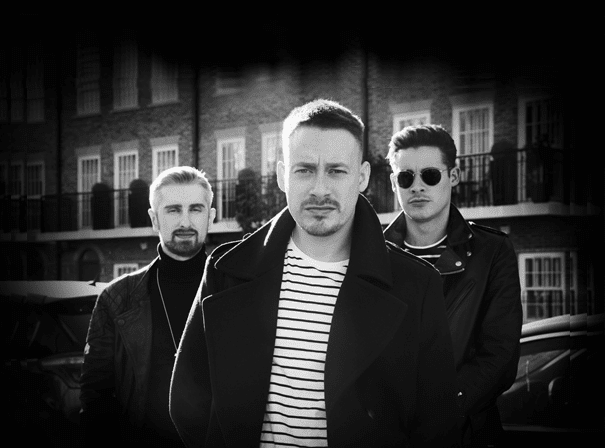 Made up of brothers Sam and Joe Lewis alongside best friend Luke Begley, the group are closely associated with pop icon Boy George, co-writing many of their songs and releasing their music through his own label BGP. Originally known as Brando, the group now known as We Are Brando synthesise influences from Depeche Mode, The Pet Shop Boys and Bros into a new and original sound that is perpetually evolving. Dark, edgy, and dramatic, their synth-heavy tracks fuse epic drum beats, surrealist synths and emotive vocal performances to produce melancholy masterpieces infused with the spirit of synth-pop and electro. Following the success of their breakout singles “Star Crossed Lovers” and “I Don’t Know What I Want”, We Are Brando released their latest, “Trains”, in late 2018. With a video produced by acclaimed director William Baker, the song touches on themes of identity, faith and isolation, announcing We Are Brando as three of the next generation’s most thoughtful and talented songwriters. With a full-length release currently in production, and live dates in the calendar, these gifted musicians are set to continue their meteoric rise in 2019.